If I’ve lost or bored you already. Stay with me. Where am I going with this, you ask? The church, of course. I have noticed a widespread phenomenon in today’s Christian culture, one that is certainly not unique to believers. I speak of what I think of as “celebrity Christians.” They may be pastors, teachers, speakers, musicians, worship leaders, or even pop culture icons who profess their faith. They are everywhere, and we love them. I talk to Christians all the time, well-meaning Jesus followers, who are enamored with the teachings or ideals of a particular public Christian figure. Some contemporary voice who has a clear-cut answer for everything they need one for. Your favorites may have already flooded to mind. But this reality offers us some interesting questions. I think as Christians, we often find ourselves in a similar plight as our history lesson above. No, not a depression – but a crisis. A crisis of faith, no less. We have deeply troubling questions, unsettling circumstances, and mysterious realities for which we want clarity. Simply put: We want answers. And so, we look up. We look up for someone who surely has them. This pastor or that new trendy author. Sometimes its smooth and pleasing to the ear, and so the best sounding message garners the greatest following. Other times its radical or trend-rejecting, and thus receives the dissenting majority as adherents. We ascribe to someone such power and authority, hoping our trust in them will offer some semblance of peace in our chaos of questions. The beauty of days in which we recognize icon’s like Martin Luther King, Jr. and the movement he represents is that it offers us the perspective of just how far we’ve come, and it is a solemn reminder of where we once were. I have recently observed a number of scenarios that have caused me to question what Christian equality truly looks like and what our collective next step must be. What better setting to offer these reflections than the holiday dedicated to a man who championed the “content of character” as a person’s value rather than the color of their skin. This was truly a man who envisioned a community in which “all flesh” see things together. 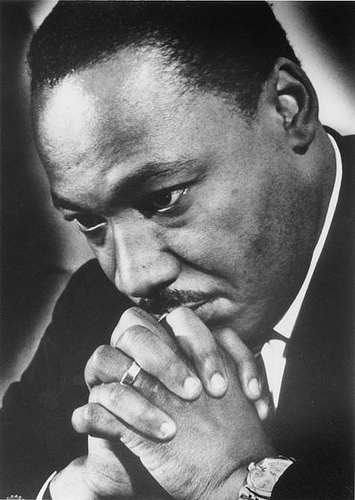 I thank God that I have grown up in a world that stepped beyond the tragedies of segregation and mass, racial injustice. My lifetime has not known appearance as a perquisite. My classrooms, locker rooms, universities, teams, and social settings have always been painted with a beautiful spectrum of diversity, worlds apart from where America could be found on the eve of King’s 1963 “I Have a Dream” speech. A host of courageous leaders pioneered a movement for equality in that decade. But that was the need for that decade. That was the necessary step toward true equality in that day. I look around and ask, What must be ours?